Right now 44 Woolson St. is a vacant lot – but not for long. Come by in eight weeks and you will see a community garden, complete with new fencing, planting beds filled with seedlings, and two young pear trees flanking the entrance. The project is the work of the Mattapan Food and Fitness Coalition, Boston Natural Areas Network, and many neighborhood residents, including Mirlande Joseph and Reann Gibson. After an incident in 2010 in which four people including a toddler were dragged outside and shot, Woolson Street has come to symbolize urban violence. A dozen other shootings have occurred there over the past 20 years. But according to Joseph, who is resident coordinator for the new garden, the five-block street has many long-time residents with a sense of community. Those residents believe a garden is the natural way to strengthen that bond. Three years ago, Vivien Morris, chairman of the Mattapan Food and Fitness Coalition, took a look at the city-owned lot at 44 Woolson St. “We were initially attracted to the site because of its proximity to the Fairmount Greenway and the opportunities for biking,” said Morris. “Developing that lot would add to the green space and attractiveness of the area.” With Reann Gibson helping to recruit the neighbors, MFFC held several gatherings to explore how residents would like to use the space. Alternatives included a playground or a small park. “But right from the beginning there was a strong consensus for a garden,” said Morris. Woolson Garden Design: Courtesy of Gretchen Schneider, AIAAt this point, Morris turned to the Boston Natural Areas Network. According to interim director Vidya Tikku, BNAN has a mandate to turn city-owned land into community gardens. BNAN has prioritized several sites in Dorchester and Mattapan. “Woolson Street was at the top of the list,” she said. According to Tikku, the city has many vacant parcels that could be used for community gardens. “But we don’t release any of those parcels unless the neighborhood is really committed to maintaining the garden,” said Tikku. The people of Woolson Street will appoint coordinators, set the rules and manage the garden themselves. BNAN engaged architect Gretchen Schneider to meet with residents over the winter, sketch out their vision and develop a design. Construction is about to begin. On Saturday, May 3, residents came out to sign up for individual plots and help clear the lot as part of Boston’s annual cleanup, known as Boston Shine. Devon Campbell, 46, was the first to sign up. “I’ve lived on this street for ten years,” said Campbell. “This is now my home.” Like many people from the West Indies, Campbell prefers to cook from scratch. He likes the idea of growing his own fresh ingredients. He knows that gardening is hard work, but he has decided that his son and daughter, 6 and 12, will help. “They don’t know that yet,” Campbell said with a smile. 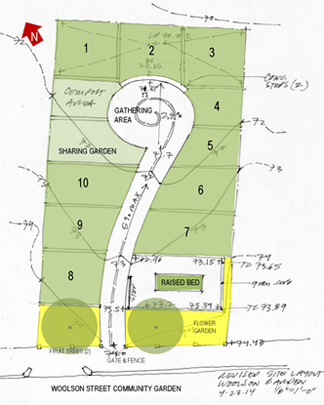 The new garden will have ten individual plots arranged in a gentle curve leading to a common area for community gatherings. A compost area in back will turn weeds and clippings into fresh soil. Waist-high beds and pathways will be accessible to wheelchair users. The residents plan a memorial within the garden for victims of violence on the street. Looking at her neighbors spread along Woolson Street, wearing Boston Shine tee shirts and raking out shrubbery, Joseph declared success. “I have my street back. I have my community back,” she said. The Woolson Street Garden is featured on the site, MakeArchitecture Happen.com. Organizers hope to crowdsource funds by getting 200 people to donate $25 each.